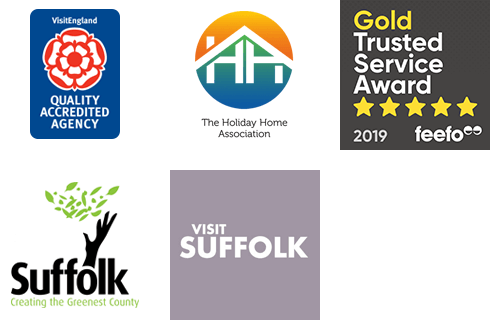 Here at Suffolk Secrets we're proud to be adding holiday homes to our portfolio all of the time. We love our latest recruits which are all listed on this page. TRAVEL TIP: Looking for late availability in peak season? Looking for new properties is often a great place to start if you're struggling to find a holiday cottage in the peak season but have left it to the last minute to book. Many of our popular properties book for summer in January or February, but properties that we take on in spring and early summer tend to have availability for the peak season. The perfect retreat for any couple looking to relax and enjoy the beautiful town of Woodbridge and beyond. A more unique property would be hard to find. For a holiday that will be the envy of all your friends - be sure to stay at Hideout! In the centre of Felixstowe on the Suffolk coast. Special offerIntroductory special offer! 10% off any booking made between 25th March - 30th April taken anytime during 2019. A cosy cottage located in the centre of Aldeburgh, Stone's Throw offers lovely accommodation for a coastal holiday. 15 Hillfield Court a newly refurbished ground floor apartment oozing with style and comfort, the perfect retreat for any small family or couple looking to come away and enjoy all the wonderful Suffolk coast has to offer. A deceptively spacious detached cottage on a quiet cul-de-sac, Nightingale Corner is a charming holiday cottage in the centre of the popular village of Westleton. Situated in the centre of the popular coastal town of Southwold Pilgrims offers guests spectacular views over St Edmunds Green within a newly refurbished apartment. Packed full of history, 55 Pump Street truly is a unique property, with an utterly stylish interior. The perfect stop for your next Suffolk getaway. Wonderfully well equipped with all you could possibly need for a holiday in Suffolk, Alde Cottage is truly a home-from-home. Complete with off-street parking, generous garden and woodburning stove. In the popular seaside town of Lowestoft, Traeth House is a beautiful property ideal for any large family or group of friends looking to enjoy the Suffolk coast. Victoria House lies just moments away from the glorious Southwold seafront. Well-presented and beautifully decorated five bedroom property offering guests a touch of luxury during their coastal escape.